What attracted you to GCU? The current economy and job market in America have been shaky. Many of today’s companies (including several of America’s universities) are experiencing financial and staffing setbacks. The explosion of growth GCU has seen in recent years is a favorable sign that the organization does a great job combining both its mission and advancement strategy. My longtime friend, Dr. Joe Veres, executive director of GCU’s Student Development and Outreach, often describes the great things happening at GCU. A major selling point is how the campus reaches out to the surrounding community and exudes “Christlikeness” in the area of servant leadership. My wife is also in the dissertation stage of the Doctorate of Education program here and she has nothing but great things to say. To be honest, I believe GCU is the best university in the state of Arizona. For all this place has to offer (a top-notch education grounded in Christian values and doctrine), there’s no better school in Arizona. What an amazing institution to work for! What do you do for fun and where do you find that outlet? I can’t say I’m a “movie buff.” I don’t remember too many actors’ or directors’ names, but I really enjoy movies. I also like 1980s arcade games. What are you passionate about? I am very passionate about seeing the “last” become “first”. There are many disparities in education and resources for America’s children who live in poverty. I’m so thankful for all of the profit and non-profit organizations that have courageously taken on the burden of improving life for our poorest youth. My passion is to see this effort continue. What are your favorite places or events in the Valley that you like to visit? A few of the places I love visit are the Phoenix Zoo (especially Zoo Lights in December), Maricopa’s Salsa Festival, and the annual Winter Jam Concert (featuring top Christian artists). Tell us something about yourself that most people don’t know: I love to play music and sing. I play both the piano and drums at my church (depending on the need). I am also currently the worship leader. What attracted you to GCU? I like the fact Grand Canyon University is a Christian University, and that while offering online programs much like every other college and university, its primary focus is on campus operations. What do you do for fun and where do you find that outlet? I like hiking and exploring new areas. I also like woodworking and building furniture in my spare time. I like to build smaller furniture step stools, chairs, benches, mostly outdoor lawn furniture. I have built custom frames in the past but do not have the space or equipment to do that now. My favorite woodworking project was to build a doll house for my daughter 25 years ago. What are you passionate about? I’m passionate about fishing and I love to travel to places I have never been, which is getting more difficult as time goes by. Not for the lack of time, but because I have lived all over the world. My favorite place to visit or live is Jejudo Island off the south coast of Korea. Koreans refer to the island as the “Hawaii of Asia,” as people from most Asian countries vacation there. What are your favorite places or events in the Valley that you like to visit? Any place with great food and hiking. My wife and I have walked all the trails at South Mountain and walk one of the trails five or six times each week. Some of the best restaurants are in the south Phoenix area near South Mountain. Two of the best I have found are Poncho’s Mexican Food on Central Avenue just north of Baseline Road. It is family owned and operated, and the most inexpensive place I have seen in the south Phoenix area. The other is T-Bone Steak House on 19th Avenue is a rustic, old restaurant with a true Western flair. The building was built as a private residence in the 1920s and constructed of river rock and adobe. It has amazing views of the Valley, especially on a stormy night, and the steaks are cooked on a fire grill. Tell us something about yourself that most people don’t know: I am pretty much an open book and if someone asks I am not shy about what I tell about myself. What are you most proud of? 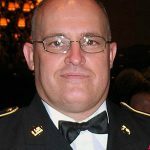 I retired from the U. S. Army at the rank of Sergeant First Class after 25 years of military service.